I hope you all enjoyed last week’s throwback-to-the 80s article. This week I am returning to the 21st century to take a look at passing offenses. I’m going to focus on pass-catchers, but I’ll make note of projected OL pass-protection performance as well. This group has to be in the conversation for the worst collection of pass catchers in the NFL. The Cowboys were right to move on from Dez Bryant, and Jason Witten was right to move on from the Cowboys, but this group was pretty bad in 2017, and it’s hard to see improvement. The top three WRs on roster combined for 1,344 yards and 6 TDs last season and no WR finished in the top 25 in receiving efficiency. I like Michael Gallup as a prospect, but this is a group of third/fourth receiving options miscast as first/second options. And somehow, TE and RB might actually be worse. The TEshave a total of 9 career receptions and 94 yards in the NFL. Ezekiel Elliott is an outstanding running back, but he’s not a particularly good receiver, and Rod Smith is never going to be on the field enough to be a significant contributor. The Cowboys added Tavon Austin and plan to get him “12-24 touches per game”, because why wouldn’t the league’s least creative coaching staff want to feature a gadget player who averaged 4.6 yards/target in the past three seasons? Dallas may have the best run-blocking OL in the league, but since the core of Smith-Frederick-Martin was put together in 2014, this OL has been mediocre in pass-blocking every season, and La’el Collins is a weak spot at RT. If Dak Prescott is going to succeed in the NFL, he needs a lot of help. I just can’t see where they gave him any. This group lost two under-producing players, and somehow got worse. This group of WRs has a good blend of skillsets – a physical, jump-ball guy in Doctson; a field-stretching speedster in Richardson; a shifty slot guy in Crowder – sort of a JV version of the Eagles. All three of these starting WRs have flashed talent, but none have produced consistently, and Doctson and Crowder were among the least efficient WRs in the NFL in 2017. Still, I like the mix here if these guys can play to potential and click with Alex Smith. A healthy Jordan Reed and the ageless wonder Vernon Davis is one of the best 1-2 receiving combinations at TE in the NFL… but a healthy Jordan Reed is like a black swan or a unicorn. I would like to see more sets with both these guys on the field together. A healthy Chris Thompson (not quite as rare as a healthy Jordan Reed, but close) is a top five receiving RB in the NFL, and Jay Gruden was finally figuring out how to use him in 2017 before he went on IR. Last year the Redskins OL struggled in pass protection, but if healthy, this is a top 10 pass-blocking line in the NFL. I particularly like two strong bookends in Williams and Moses. Overall I see an unimpressive group of WRs but a really strong group of TEs and RBs. That could pair well with Alex Smith’s strengths as a passer. 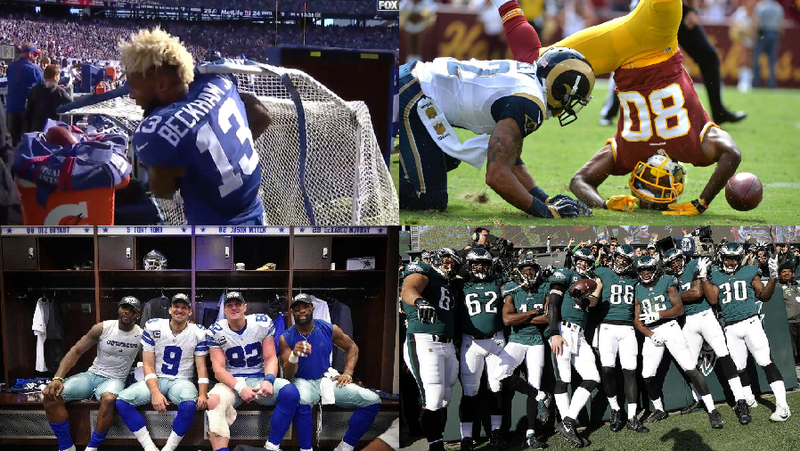 The Eagles and Redskins share a blueprint for their wide receivers: a big target (Alshon Jeffery), a field-stretcher (Mike Wallace), and a dedicated slot guy (Nelson Agholor). The Eagles just do it with better players. The Wentz-Alshon connection was actually really inefficient in 2017 but was heating up the weeks prior to Wentz’s injury. Mike Wallace is an upgrade over Torrey Smith and I expect Nelson Agholor to build on his breakout 2017. The Eagles passed from multiple TE sets more than all but one other NFL team. Zach Ertz established himself as a legitimate top TE in the NFL, and the Eagles drafted Dallas Goedert to replace (and probably upgrade) Brent Celek and Trey Burton. The Eagles did not utilize their RBs much in the passing game in 2017, thanks largely to the injury to Darren Sproles in week 3, but that usage should increase with Sproles returning. The Eagles offensive line is maybe the best pass blocking unit in the league. Lane Johnson, Brandon Brooks, Jason Kelce and Stefen Wisniewski combined to allow just 2.0 sacks in 2017, and the line should get even better with the return of a healthy Jason Peters. The Eagles spread the ball around a lot in 2017, and with the addition of Goedert and the return of Sproles I expect that to continue in 2018. The Giants have the only true no. 1 WR in the division (and a top 5 WR in the league) in Odell Beckham They complement him with a dangerous player from the slot in Sterling Shepard. They added Cody Latimer after four unimpressive seasons with the Broncos, but he should be accustomed to playing with terrible QBs, and should be fine as the 4th/5th receiving option on this offense. Evan Engram is a tough matchup player and put up an impressive rookie season by volume. He wasn’t efficient on a per target basis, but I can’t hold that against him playing on that offense. He looks like he could make a leap in his second season, particularly with a healthy Beckham drawing attention on the outside. Saquon Barkley runs routes like a receiver and a smart offensive coach will be able to line him up as a receiving target anywhere on the field – out wide, in the slot, from the backfield, etc. – and target him often. I’m not buying this revamped OL. This is maybe the best group of pass catchers in the NFL, but a leaky OL could be rate-limiting for this passing game. Ultimately I think this passing offense will be held back by poor OL play, an inconsistent run game and poor QB play, but they are in the conversation for the best corps of pass-catchers in the NFL. I expect to see some explosive plays but a lack of overall consistency.